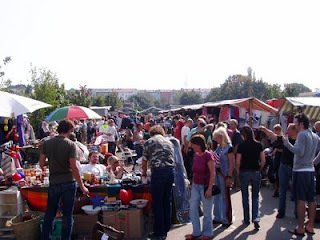 Vivian Girls/Uptown Bums/True Widow (The Cavern): While overseas this past summer, I was in the middle of doing some unbelievable record shopping with some friends in Berlin's beautiful Mauerpark Flea Market, before we were rudely interrupted by two pushy members of Vivian Girls' European street team. These two young men saw the records in my hand, and immediately tried to push these mini tour posters into my free hand, while trying to tell me about the group's upcoming shows. I quickly explained that I had seen the Vivian Girls twice in the States already, one time was pretty good, the other not as good, and that I didn't want any promos. They seemed stunned and fascinated by this admission, and began to probe me about it. I went on to explain that I understood the excitement behind the group, how I thought they were decent, but that perhaps they could do more with the overall concept, besides just putting out song after song, with little distinction from one to the next. I also told them that I thought they had a lot they could do with what I felt was basically a "good sound" and I appreciated the historical sonic references, but that the whole thing was in danger of being beaten into the ground and sinking under the smug weight of a record collector's smirk, and that this was never more apparent than over the course of a show with an overly long set-list. They nodded with the desperate desire to understand the incredibly complex American and I let them know with the vaguest of gestures that I didn't want to murder them for being part of something as pathetic as an indie rock street team. What had started as an awkward and almost unfriendly encounter ended with both parties coming away having better understood each other, and the guys waved and smiled at my friend and I as we left the market, even though I had pretty much dissed them and their product. Can we please have that kind of civility here too, even though we all really disagree with each other, and I hate your guts and you hate mine? How about it? 80's Night With DJ G (Hailey's): DJ G is one of the most knowledgeable guys around town, and if they handed out PHD's in 80's music and Italo Disco, well, he would have a few hanging in that dark little sound booth at Hailey's. All that being said, whoever made the way-off assertion that Bill Laswell is the kind of stuff that's overplayed at 80's Nights in Denton not only baffled a handful of us, but I would still say you're more likely to hear a crowd singing along to Simple Minds than getting annoyed that Material is too repetitive or whatever you imagine actually takes place at these events. Buddy Guy (House Of Blues):Buddy Guy is one of those living Blues greats that everyone's dad likes, yet few armchair blues critic dads can ever tell you why Buddy Guy is any good, or why he matters other than some generic answer that involves Clapton rather than the far superior Magic Sam. I actually find that Guy's improvisational playing often comes off as fascinatingly sloppy, however that is meant in the best way possible. He is always the highlight of any of those cheeseball all-star blues lineups you catch on PBS pledge drives simply because he is daring enough to play something unconventional next to a bunch of by-the-book stiffs.